We realize that not every candidate has a strong understanding of the issues that face today's working families and organized labor. The candidate academy is designed to familiarize candidates with the political and policy priorities of working families in Orange County. Participants will have the opportunity to learn about pressing issues from union leaders, rank-and-file members and community leaders--ranging from wage and contract issues to the environment, education, health care and affordable housing. Our candidate academy is mandatory. 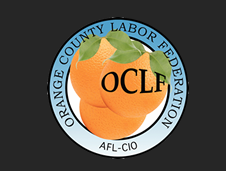 If you are interested in receiving an endorsement or recommendation for endorsement by the Orange County Labor Federation, you must attend at least one academy session. Please contact the Orange County Labor Federation for future Candidate Academy sessions. After completing a COPE candidate questionnaire focused on the issues facing today's working families and organized labor, candidates will be interviewed by the COPE Interviewing Committee made up of union members appointed by active major unions in Orange County. After the interview process, an endorsement recommendation will be made by a two-thirds vote of the COPE Interviewing Committee. To schedule an appointment, you must call Joline Cruz at (714) 385-1534. The endorsement recommendation made by the COPE Interviewing Committee is then reviewed and voted on by both the Orange County Labor Federation's Executive Board and the delegates of all affiliated unions. If a candidate receives at least two-thirds vote from the Executive Board and the delegate body, then that candidate is endorsed by COPE. (Note: Federal and State Candidates are recommended to the California Labor Federation Endorsement Convention. The recommendations are final once the state delegates approve). Once a candidate is endorsed by the Orange County Labor Federation's Committee on Political Education, a campaign follows that includes at least one if not all of the following components: direct mail to voters in support of the candidate, door-to-door voter education, voter education via phone, and financial contributions. To begin your endorsement request, please complete and submit your questionnaire to Joline Cruz via email at joline@oclabor.org. OCLF address: 309 N. Rampart St. Suite A. Orange CA, 92868. Please contact George Doctorian at 714.385.1534 to schedule your interview appointment. Please complete and submit your COPE Questionnaire by THURSDAY, DEC 13,2018 to Joline Cruz via email at Joline@oclabor.org or mail to OC Labor Federation - 309 N. Rampart St. Suite A, Orange, CA 92868.